There have been many amazing advancements in the culinary arts over the years. These range from the invention of ice cream, the creation of burgers, and the genius invention of Milo Ais, which is just the best. Introducing; the Makirito, also known as the Sushi Burrito! Found at APW Bangsar, the Makirito is available from a pop-up by the same name. This burrito is essentially a large salmon sushi roll, rolled up in the shape of a burrito. It comes with options for different kinds of sauce and contain ingredients such as salmon, seasoned rice, and all kinds of tasty greens. They also serve different variations of the burrito such as salmon, beef, shrimp, and so on. The ingredients are fresh, the food looks great (and totally Instagram-worthy), and it tastes great too! If the numerous positive reviews left on their Facebook page are anything to go by, we are hardly the only ones who think so. 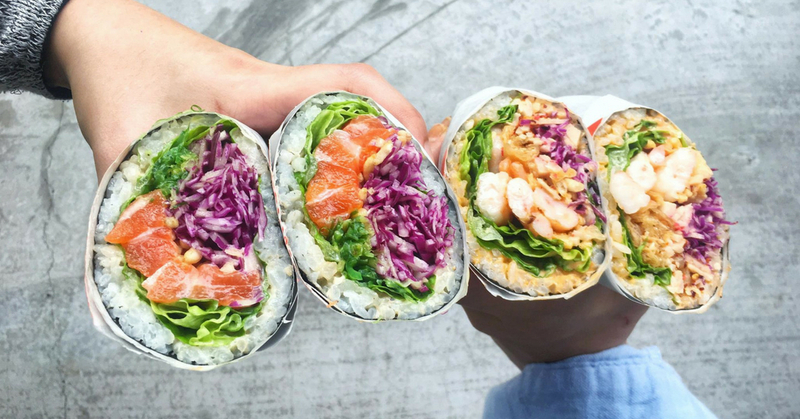 The Sushi Burrito looks to be a healthy and tasty snack for people on the go to pick up and enjoy, or to be shared among friends. Would you try this amazing fusion food? What flavour would you favor?